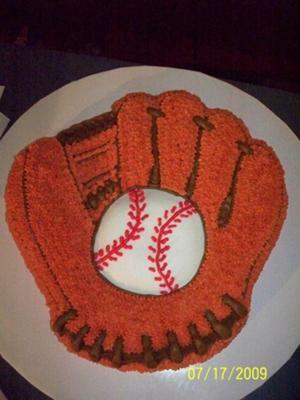 I did this baseball glove cake for an auction and my husband loved it. I used the baseball glove shaped pan I bought off ebay, and I used one cake mix. I baked according to directions and let cool. I used buttercream in copper, brown, white and red. I did the baseball in white first and let dry a bit then smoothed it with a viva paper towel. Then I did the outlines in brown and the red stitches on the ball. Then I filled in the glove portion with copper stars. Yes, it can be a turkey. thanks for the compliments.